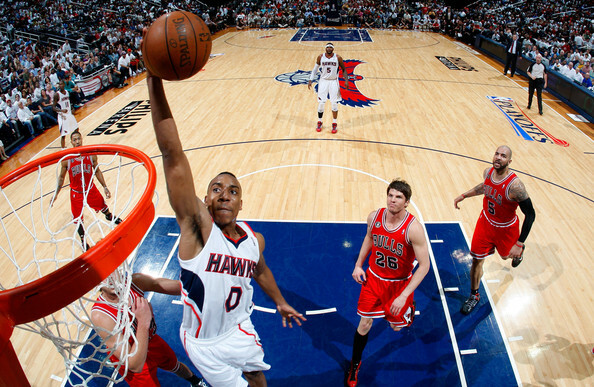 Before the second round of the 2011 playoffs began, the only people who knew who much about Jeff Teague either religiously followed the Atlanta Hawks or had an unhealthy obsession which consisted of documenting the professional careers of former Wake Forest basketball players. Whether you knew who he was or not, Teague's career before the Hawks second round series against the Chicago Bulls was basically irrelevant to the vast majority of basketball fans. This isn't to say that Teague wasn't a solid player, but in the broad NBA spectrum how relevant is a non-lottery pick who spent the last two seasons toiling on the Atlanta Hawks bench? Playing that role again this past season, Teague appeared in 70 games for the Hawks and sported modest averages of 5.2 points and 2 assists while logging about 13 minutes of floor time per game. Although he showed himself capable of providing a spark off the bench during certain stretches, Teague's production during the regular season wasn't anything special and it's not surprising that a young guard in his position didn't get much of a chance to distinguish himself. After all, Teague was on a veteran Hawks team that had made the playoffs in each of the last four years and he was sitting behind proven players like Joe Johnson, Jamal Crawford, Mike Bibby, and after a mid-season trade, Kirk Hinrich. But everything changed for the 6'2'' Indianapolis native when Atlanta's starting point guard, Kirk Hinrich, injured his hamstring in the Hawks series clinching victory over the Orlando Magic. For better or worse, Hinrich's injury suddenly thrust Teague into Atlanta's starting lineup as they were about to begin their second round series against the top seeded Chicago Bulls. Despite the fact that Teague played just nine total minutes during the Hawks series against Orlando, in which he scored a measly five points and failed to even take off his warm-ups during four of the six games, he certainly didn't look like anything but starter material when he got a chance to play full-time against the Bulls. 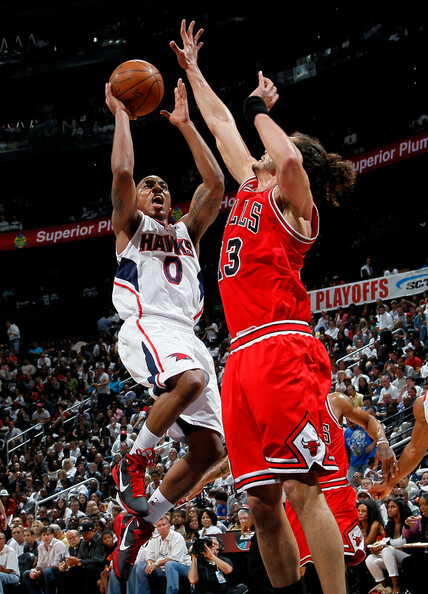 In what had to be one of the toughest challenges any individual player in the NBA faced all season, Teague (who had started just 10 total games in his young NBA career) was matched up against the newly crowned MVP in Chicago's Derrick Rose, and the little used Hawks backup held his own. Let's be clear, Teague certainly didn't outplay Rose, who continued his magical season with averages of 29 points and nearly 10 assists against the Hawks in leading the Bulls back to the Eastern Conference Finals, but Teague showed that he has the potential to be a productive starting point guard in the NBA. Overall, he averaged 37 minutes per game while recording 14.8 points and 4.1 assists (numbers which no doubt would have been better had he not hurt his shoulder in Game Six) all the while providing Atlanta with a player who could push the tempo and make plays on both sides of the court. Teague's performance was a big reason why the Hawks stayed competitive with the Bulls for most of the series, even if they ultimately succumb to a more talented and defensive minded Chicago Bulls team. Even though the Hawks fell to the Bulls in six games, Teague's play started turning heads and more than a few people have voiced the opinion that the young point guard should be in Atlanta's starting five whenever next season begins. If this suggestion seems like hyperbole or a simple overreaction from Hawks fans who have been missing a player like Teague on their roster for the last few seasons, it might be, but this young point guard played the best basketball of his life on the biggest stage he's ever seen against the best player he's ever played against. A feat that few guys in the NBA can say they've accomplished. If that was all there was to this story, it would be a nice uplifting tale about a kid who made the most of an opportunity, but here's what I'm stuck wondering in the aftermath of Jeff Teague's coming out party: was he a different player a month ago than he is now? The thought that Teague suddenly woke up on the morning of Game One against the Bulls a better or more prepared player than he was during the Orlando series just a few days before is an argument few would make and even fewer would actually believe. The only thing that changed about Jeff Teague was the situation he found himself in and this is what can make life in the NBA so frustrating for young players who are trying to make it in the competitive world of professional basketball. Often times in the NBA (much like life itself), it's not about how talented you are (because let's face it, if you're on an NBA roster you have to be pretty good) it's about finding the right set of circumstances which will allow you to succeed. Obviously, I'm not suggesting that any player on any NBA roster could become a starter if given the right opportunity, but we will never know how many other Jeff Teague's spent this past season watching more games than they played in because they simply couldn't get a chance to show what they're capable of. A player like Darren Collison of the Indiana Pacers is a perfect example of the Jeff Teague paradigm. Not many people had high expectations for the former UCLA standout when the New Orleans Hornets selected him with the 21st pick in the 2009 draft. The 6'0'' point guard was seen as a guy who would probably make a solid bench player who was capable of pushing the tempo while the starters were taking a breather, but not much more than that. But during Collison's rookie season, injuries to Chris Paul gave the diminutive California native a chance to impress rather than sit behind Paul and play just a handful of minutes per game. With Paul out of the lineup battling an early season ankle injury and later a more serious knee injury which caused him to miss over 40 games, Collison hit the ground running and even his harshest critics couldn't ignore how well he was playing in the absence of one of the NBA's best players. 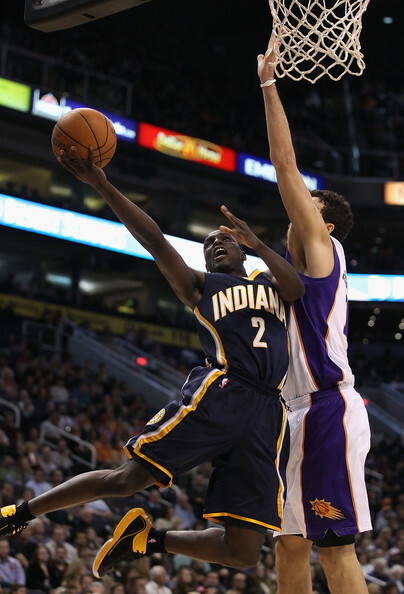 Collison's 12.5 points and 5.7 assists during his rookie season, (which included averages of 18.8 points and 9.1 assists while he was subbing for an injured Paul) made enough of an impression on the Pacers front office that they traded for him over the summer and then gave him the keys to an up and coming Indiana roster. Just like Teague, it's difficult to know where Collison would be right now without getting a chance to play when Paul was out of the lineup, but it's safe to assume that he wouldn't be a starting NBA point guard in just his second season in the league. Obviously, there are countless examples of players who made the most of an opportunity like Teague just did over the last few days, but his transformation from little known bench player to impact performer in the Eastern Conference Semifinals is as remarkable as any. For most players in the NBA who aren't LeBron or Dwight Howard, having a successful career seems to have almost as much to do with how talented you are as what situation you're placed in and what opportunities you're given. How else could you explain the sudden emergence of a player like Jeff Teague, who over the course of six games went from an after thought on his own roster to the potential starting point guard for what figures to be a playoff caliber team next season. The NBA might not be a very good mirror of the reality that your average person wakes up to every day, but at least in this instance, it would appear that even the best of the best need a fortunate bounce once in a while, just like the rest of us. Jeff Teague's fortunate bounce came in the form of Kirk Hinrich's injured hamstring and it seems like he might never look back. It's impossible to say how Teague's career would have unfolded had Hinrich not gotten injured nor will we ever know how many other Jeff Teague's are sitting on NBA rosters right now hoping for the same opportunity he was given. But we'll certainly know them when we see them making the most of their chance. After all, we noticed Teague.